I can’t really blame the Republicans for getting excited about last night’s election results. Lord knows they are desperate for some good news after getting their clocks cleaned in the last several elections. But one thing should be made clear about this election. While Republicans may have won two big gubernatorial contests in Virginia and New Jersey, the clear losers in this election were the Teabaggers. No matter how they want to spin this on rightwing radio, Nancy Pelosi now has an even bigger majority in Congress than she did the day before. Democrats won a congressional district in upstate New York (23rd) that they had not won since the Civil War. They also held onto a Democratic district in California, replacing a moderate-conservative Democrat with a decidely more progressive Democrat. The California contest got hardly any attention at all because all eyes were focused on the NY23 race after Sarah Palin swooped in an annointed independent Conservative Party nominee Doug Hoffman as the Teabagger favorite over the mainstream Republican nominee Dede Scozzafava. The Teabaggers then went to work villifying Scozzafava because of her pro-choice views and her position on gay unions. Things got so bad that Scozzafava ended up dropping out of the race three days before the election and endorsed her Democratic opponent Bill Owens. But all the fawning media attention, the gobs of money (95 percent from out of the district) and the backing of nearly every prominent rightwinger in the country was not enough to lift Hoffman to victory on election day. For some reason, the voters in the 23rd District did not support a candidate who lived outside the district, knew nothing about the issues impacting the district and got most of his financial support from outside the district. Imagine that!!! But Republicans can still celebrate their victory in Virginia where conservative Republican Robert McDonnell trounced his hapless Democratic opponent. And there was no question that McDonnell was a conservative, however, he did not invite Palin or any of the other Teabagger crowd to come out and campaign for him and he made every effort to downplay his far right views and hew to a more mainstream position. In New Jersey, where Republican Chris Christie ousted the unpopular Democratic incumbent John Corzine, it would seem to be another big victory for the GOP. But before the Teabaggers start celebrating, they ought to check out Christie’s positions on some of their key issues. On abortion, Christie says he is “pro-life,” but then goes on to stress that he will not force his views onto anyone else as governor. Not exactly the kind of message Teabaggers like to hear. Then, on gun rights, Christie says he fully supports and backs New Jersey’s gun laws. I will let everyone guess how those might compare to laws in Texas and Oklahoma. Finally, on illegal immigration, Christie says he does not think it should be a criminal issue, only a civil one. Oh, and he supports civil unions for gay couples too. Sure sounds like the Teabaggers could have condemned Christie just as harshly as they did Scozzafava. The fact that they did not is probably due to either ignorance or hypocricy or both. 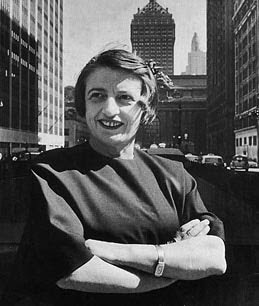 New biographies are out about Ayn Rand just as her objectivist philosophy is becoming resurgent within the rapidly shrinking Republican Party. It is not hard to understand why Rand’s philosophy - expressed in her novels “Atlas Shrugged” and “The Fountainhead” - would be popular among rightwingers today. Just like rightwing talk radio, it tells them exactly what they want to hear - that they (the readers) are privileged and special and that they should spend all their time and energy advancing their own interests and not worry about or bother with anyone else. It is the ultimate paen to greed and selfishness and that is pretty much what much of Republican political philosophy boils down to today. There is a great, basic contradiction in the teachings of Jesus. Jesus was one of the first great teachers to proclaim the basic principle of individualism -- the inviolate sanctity of man’s soul, and the salvation of one’s soul as one’s first concern and highest goal; this means -- one’s ego and the integrity of one’s ego. But when it came to the next question, a code of ethics to observe for the salvation of one’s soul -- (this means: what must one do in actual practice in order to save one’s soul?) -- Jesus (or perhaps His interpreters) gave men a code of altruism, that is, a code which told them that in order to save one’s soul, one must love or help or live for others. This means, the subordination of one’s soul (or ego) to the wishes, desires or needs of others, which means the subordination of one’s soul to the souls of others. This is a contradiction that cannot be resolved. This is why men have never succeeded in applying Christianity in practice, while they have preached it in theory for two thousand years. The reason of their failure was not men’s natural depravity or hypocrisy, which is the superficial (and vicious) explanation usually given. The reason is that a contradiction cannot be made to work. That is why the history of Christianity has been a continuous civil war -- both literally (between sects and nations), and spiritually (within each man’s soul). So Rand rejected the core teachings of Jesus without any equivocation. At least she was honest. Most “Christian conservatives” reject his core teachings as well, but they are either too ignorant to realize it or pretend that they do not. Many simply ignore all the parts of the Bible that have to do with helping the poor and loving your neighbor - which takes up a sizable chunk of the New Testament - and instead focus on things like abortion and gay bashing which are hardly even mentioned in the Bible if at all. There are also a lot of people who rush out and embrace Rand without any real understanding of what it means. It is not as if you can be a Randian and a Christian at the same time, kind of like being a fan of both Star Wars and Star Trek. These are two completely divergent philosophies that are opposed to one another. One says love your neighbor as yourself, the other says love yourself and screw your neighbor. The way that many Republicans and conservatives today embrace Christ’s image while ignoring his teachings is similar to the way that they embrace the images and symbolism of America, but ignore or reject the actual workings of the government - the hard-fought, messy compromises, the diversity of races and cultures, and even the bloated bureacracy, without which there would be no country of which to speak. Frank Rich's column in Sunday's NY Times is a must read this week. One can't help but wonder if we are witnessing the disintegration of the Republican Party. The wingnuts and the teabaggers who are taking over the Republican Party forced the Republican nominee in the race for the 23rd Congressional District of New York to drop out because they deemed her to be insufficiently conservative. Instead, they are backing the Conservative Party nominee - someone who doesn't even live in the district and has no clue or interest in the issues impacting the district. Now the Republican nominee, after having been forced out, is endorsing the Democrat in the race. Whether or not the Democrat wins - and no Democrat has won this district since the Civil War - this is a win-win for the Democrats as the Republicans continue to run off moderate (and sane) voters and continue to shrink into electoral insignificance.